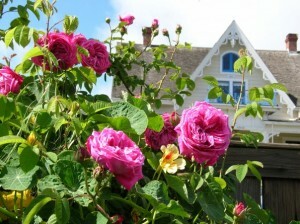 ‘Paul Ricault’ roses with MacCallum House in the background. When rose preservationists in Mendocino County began collecting and propagating “found” roses, they were bemused and intrigued by the broad range of varieties they discovered. Among the expected “traditional” cultivars such as ‘Dorothy Perkins’ and some of her relations, ‘Harison’s Yellow,’ and ‘American Pillar,’ some sumptuous and more elegant roses were growing, and rosarians speculated on how some of them might have first come to this isolated, rough area where most human endeavor was given over to the hard labor of survival on a frontier and the extraction of a valuable resource — timber. That resource, and its shrewd exploitation by some of the early arrivals around 1850, made many of those pioneering, adventurous men wealthy. Some of them squandered their fortunes in poor investments; others a bit wiser, were able to create a stable, comfortable environment for themselves and their families and they settled into a role as the town of Mendocino’s founders and elders. They bought and sold land, built homes (many of them beautiful and well-crafted and still in use today), organized a structure for law and order, and quickly created a town suitable for women and children. William Kelly, who worked at building the first mill in 1852, was one of these founders and in 1855 he was able to bring his bride Eliza to this remote yet bustling community. 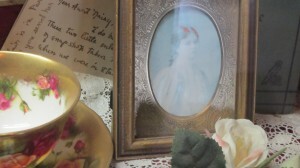 It was into this early, well-to-do family that little Emma Kelly was born in 1859. The young girl’s sunny nature gained her the nickname of “Daisy” and she was known that way for all of her long life. Mrs. Kelly was determined that her children (Daisy had a sister and two brothers) would grow up as ladies and gentlemen. Though Mendocino was a safe (and lively) place to live, it still had few amenities. The Kellys spent considerable time in San Francisco, enjoying a more cultured atmosphere. Daisy’s sensibilities were apparently honed by her youthful experiences because, at a young age, she changed the spelling of her family name to Kelley to add a small note of elegance. 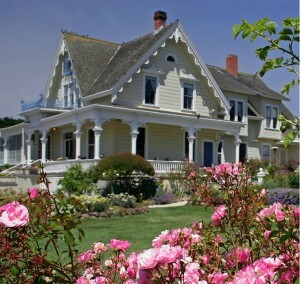 The change prevailed, as is reflected by the name of the Kelley House Museum in Mendocino. Daisy’s penchant for name “enhancements” appeared again when, at age 20, she married Alexander McCallum, her uncle Capt. Blair’s bookkeeper, and soon altered his name to MacCallum, another change that persists to this day. 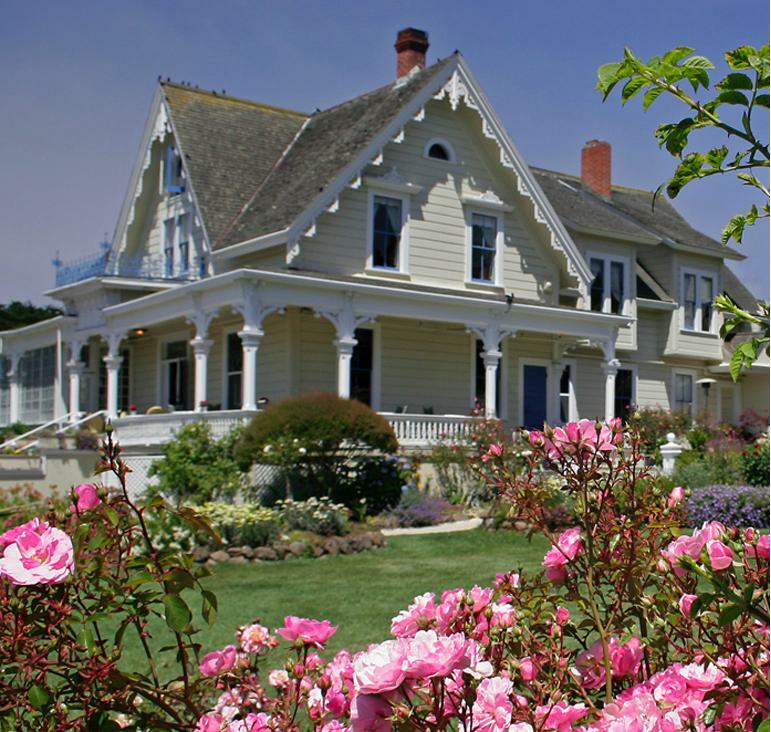 Daisy continued to divide her time between Mendocino (where her parents built her a beautiful home that currently houses a thriving bed and breakfast inn) and San Francisco. But in 1885 Capt. Blair acquired a tract of excellent timber land about seven miles inland from Fort Bragg and commenced a large logging and milling operation there. Rails were laid up Pudding Creek north of Ft. Bragg to the camp and the business was up and running in 1886. Blair chose young Alex MacCallum to manage this important mill and Daisy and Alex moved out to the mill site at that time. The manager’s house was large, with wide verandas, and as gracious as could be managed in that primitive setting. It was quite a change for the young wife and, with her characteristic zeal, Daisy set about civilizing her surroundings. She planted a rose garden. Once again Daisy found a more fanciful name for her surroundings; she christened the camp Glen Blair and it is still known by that name though the mill and town surrounding it are now vanished. Vanished also is most of Daisy’s original garden, though it was legend at the time. Daisy pursued her horticultural interests with her typical enthusiasm and she used her wealth and education to find and purchase the “latest” plants for her garden. Some of her plant catalogs are still found at the Kelley House Museum and are marked throughout with her penciled checkmarks, noting the varieties that she had ordered and/or found interesting. The early rose nurseries are well represented in these artifacts from Dingee and Conard, Burpee, Stocking’s, and other purveyors of the era. Daisy was one of the first members of the newly-founded American Rose Society and some of her library (including Dean Hole, Rose Kingsley, etc.) remains at the Kelley House, the pencilled notations offering intriguing clues to what might have been growing in her garden. Only a few of Daisy’s Glen Blair garden roses still grow at the abandoned site. The hardiest Wichurana ramblers, such as Gardenia, survive as they do all over the county but all else is gone. A local preservationist, Joyce Demits, was able to access the site in the early 1960s and rescued one very interesting rose, a bush form of Mme. Alfred Carriere. Joyce kept the cultivar alive, called it ‘Glen Blair,’ and just this fall a group of dedicated rosarians were able to take cuttings from that plant (as well as many of Joyce’s other foundlings) to assure its survival. The MacCallums returned to San Francisco after leaving Glen Blair, educated their children, and took part in the social life of the city. However, Alex’s death in 1908 brought Daisy and her son back to Mendocino. During the first years of her widowhood, Daisy continued to pursue her love of travel and culture. She roamed the world, always returning to her base in Mendocino. She was a founder of the Mendocino Study Club, an institution that still promotes “culture” in the town; some of the Study Club’s current members, now octogenarians, have childhood recollections of “Mrs. MacCallum” that range from awe and respect to fear. She was an indomitable presence for decades in Mendocino and her influence is still felt — and quite visible in the legacy she unwittingly left all over the county in the form of roses. Daisy began gardening in Mendocino in earnest in the late 1920s, ordering freely all the roses, perennials, and annuals that caught her fancy. She spent money on her garden, hiring locals to tend it and she was proud of it and happy to share “slips” with anyone who asked. Thus, I am certain, many rare and unusual cultivars were spread far and wide by gardeners who had some acquaintance with Daisy MacCallum. 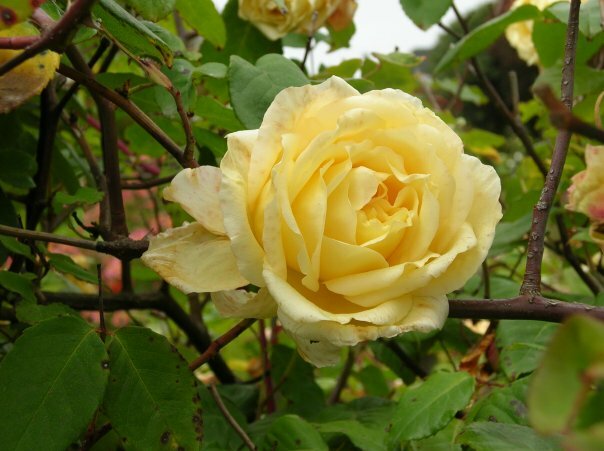 Daisy grew some of the classic Old Garden Roses as well as Hybrid Perpetuals and the early Hybrid Teas that had done well in her Glen Blair landscape. Her great love (determined by her various lists and notations) was the “new” class of Pernetiana, with its brilliant hues of sunset and dawn. While that beautiful class of roses did well in her hot inland garden, the foggy summers of the Mendocino Coast were less kind and the bushes suffered from various diseases, even while producing blooms with their exquisite color blends deepened by the cool air. Photo of the MacCallum House by of Rita Crane. When I began documenting the old bushes growing throughout Mendocino, I could only verify that eight remained in Daisy’s garden. At one time there were hundreds, many on rootstocks (two of the eight were Odorata and Canina) but after Daisy’s death in 1953 the property was untended for years and the roses disappeared. I continued to search the archives of the Kelley House for clues to the varieties Daisy might have grown, mostly hoping for clues to some of the elegant “foundlings” that continued to turn up around the area; ‘Mme. Gabriel Luizet,” “Marchesa Boccella,” “Paul Ricault,” “Souv. de Mme. Leonie Viennot” — these refined roses naturalized in many places and piqued my curiosity as to provenance, and sometimes as to identification. And then a researcher at the Kelley House unearthed (and copied for me) a document that was the equivalent of the Rosetta Stone. 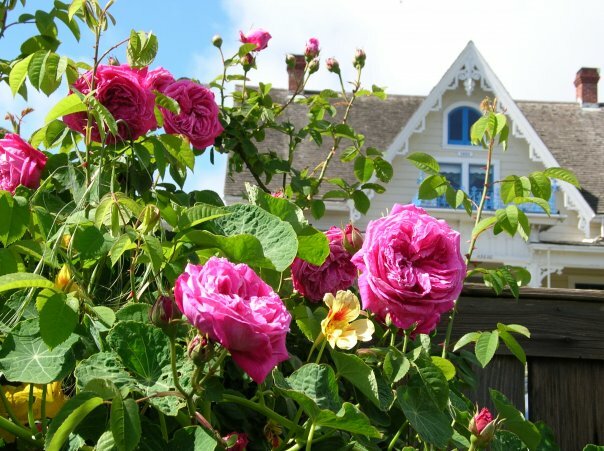 I was the delighted recipient of a several-page list in Daisy’s distinctive handwriting, titled “Roses in Mendocino in 1935.” There were 222 cultivars on the main list and more on some smaller notes that placed her roses on other properties, including her mother’s across the street. Complete with misspellings, it was clear that the names had come straight from her memory. As I had expected, there was a good array of Pernetianas, but the lists included many older roses, a truly eclectic collection. In 1935 Daisy’s garden was in its glory and she settled into Mendocino to enjoy it. During the Depression she battled the ubiquitous and destructive Pocket Gopher by offering people $1.00 a head for them. That princely sum was enough to make it possible for a man to feed his family just by tending traps in Daisy’s garden. Daisy’s determined spirit wouldn’t be thwarted by something like a gopher, and her precious roses thrived as long as she did. Now, when a “Mystery Rose” comes to my attention I turn to Daisy MacCallum’s list to see if anything she grew might be a match. It has been an invaluable tool in beginning a search for an identification for a Found Rose. As the roses of Mendocino County continue to baffle and delight us, we continue to become more aware of the role this one woman played in preserving them for us. Thank you, Daisy MacCallum. This article was first published and copyrighted in the Rose Letter, quarterly journal of the Heritage Roses Group . Author, Alice Flores. Photos of the ‘Paul Ricault’ and the ‘Etoile de Lyon’ roses courtesy of Alice Flores.